All cabinets are fully lockable for maximum security, ensuring your tools and gear stays safe. Your garage floor was designed to slope forward. Cabinets are not. The 2" adjustable legs keep your cabinets level and grounded. Wall cabinets include a mountable light valance for workspaces that need extra lighting. This redesigned Pro Series line by NewAge Products boasts 36-inch locker cabinets which are fully welded with minimal assembly required. All the great features and benefits which NewAge and the Pro Series lines are known for, are available in this new edition. The Multi-use locker comes with 4 easy-to-adjust shelves in 1-inch increments; each shelf has a weight capacity of 300 lbs. The all- new 19-Gauge steel double wall door design has full length anodized aluminum handles, with a full length locking system that secures the doors at both the top and the bottom of the locker frame. All the locker cabinets come with leveling legs or you can choose to mount the cabinets on the wall. The series has always been available in charcoal grey and a deep red finish. The newest edition to the various colour options is now available in white. 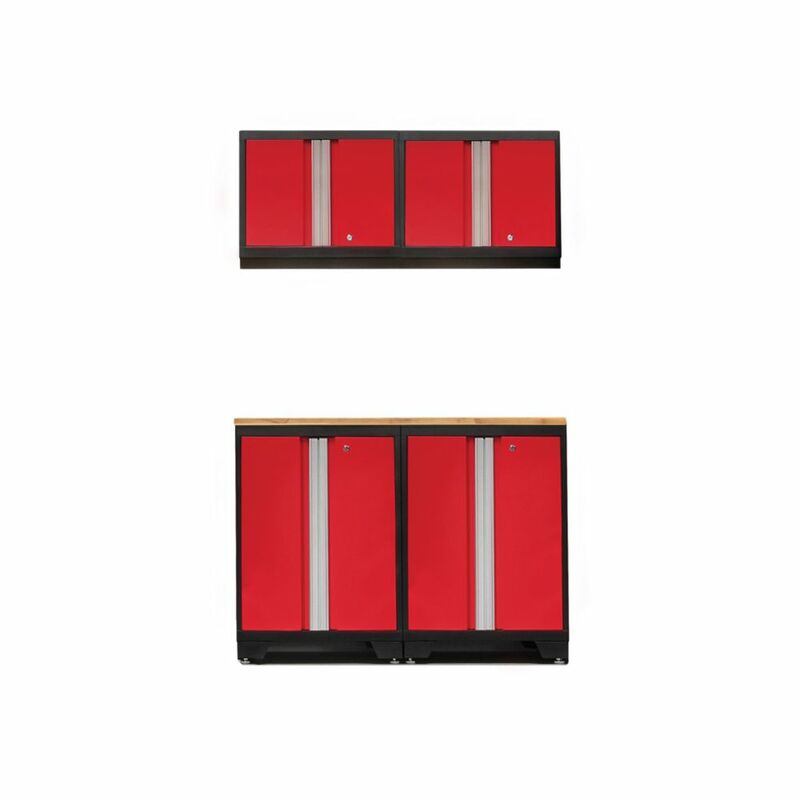 Bold 3.0 Red Garage Cabinet Set (5-Piece) Designed to make a big statement in garages, workshops, mudrooms and other areas of your home, the Bold 3.0 Series cabinet system instantly upgrades the look of your space, providing you with organized storage for all your belongings. Built with heavy-duty 24-gauge steel for added strength, these cabinets are ready to hold everything from sports equipment to gardening tools, and the scratch and stain resistant powder-coat paint finish protects the cabinets from everyday heavy use.Full-length integrated handles allow you to quickly and easily access your gear, and adjustable steel shelves give you the flexibility to store items of all sizes, while fully-lockable doors ensure that your tools stay safe.Get organized, and simplify your life, with Bold 3.0 Series Garage Cabinets. Bold 3.0 Red Garage Cabinet Set (5-Piece) is rated 5.0 out of 5 by 1. Rated 5 out of 5 by Xenos from Excellent value and quality I bought this set along with a few other pieces to fit my garage. I was very surprised with not only the quality of the cabinets and bamboo tops, but also the packaging and hardware. Every cabinet is light weight, but sturdy enough to hold plenty of your items. For base cabinets I have them resting on the floor, but used the extremely heavy duty wall mount bolts for anchors into studs. It took about 4 hours of work with another handy person to install all the cabinets you see here, and that was us taking our time to ensure we were as perfectly level as possible. The paint finish is excellent, as is the packaging. Every screw, bolt, nut, and washer is labeled and of a higher quality than I expected. I briefly considered the Pro line but chose this due to the dimensions and how they would fit my garage, and I'm glad I did. For someone opening them manybe once a week, and I will be relatively easy on them, I'm confident they will last.